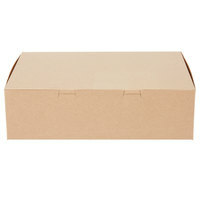 Add an eco-friendly edge to your decadent dessert service with these 14" x 10" x 4" cake / bakery boxes! Made from sustainably managed forests and at least 18% recycled wood fiber, these boxes offer eco-conscious confidence with the convenience of disposability. Great for packaging cakes and cupcakes for any type of celebration, these classic Kraft boxes add a subtle green appeal to everyday deliveries! Love these 14"x10" cake boxes. You can use them for cupcakes or for 1/4 sheet cakes. They are made very well and are easy to assemble. Great product I've used for 12 count cupcakes with insert, 16 without insert, and I've also used this box for a sheet cakes as well. Sturdy, strong, professional looking and they hold 12+ pastries. These are by far the cheapest I have found searching for something to put my pastries in and there delivered to my door. Perfect boxes! I love the color, and they are the perfect size. The size lends itself to packaging different baked goods. They are also the best priced boxes out there. Just make sure you fold all the creases well to ensure proper closing and building. Great boxes. I love these boxes. They are very sturdy. I use them for cupcakes and cakes. They really give my products a professional appearance. Love these boxes! I use these to hold our 6 jumbo cinnamon rolls. Sturdy, priced is right & love the Kraft color. Will be ordering these again. These boxes are pretty sturdy. At first sight I didn't think they would be sturdy but they definitely do the job. They are great for all sorts of desserts. I would recommend. Love these boxes! We put our labels on them and they look great! I love that they aren't the classic white box that most places have. They will show grease if you have any on your hands/fingers, so make sure to only handle the boxes with freshly washed hands or gloves! Great, sturdy boxes that we won't do without! I love products! I really like the look of these kraft boxes, and the fact that they are relatively inexpensive. I purchase both the window and non-window boxes so that I can save money on things that don't require a window. My only complaint is that I do not like how these close. That being said, I will continue to purchase because of the price. These work perfectly to hold our baked goods. Easy to put together and a great size to hold a variety of items, including cupcakes and cookies. Just as described! The top box arrived damaged, but all of the others are in ideal condition. So glad that these come in brown/natural to match my other boxes. I love the sturdiness of these boxes. Just putting them together, you can feel the thickness of these boxes. After adding my label, they are a very "eco-friendly" professional looking box. I typically always order and it is still the best brand. However; the fact that these are more or a brownish cardboard made for very bad stains from even the slight grease of your hand. I will stick with the white ones from now on in this brand from here. these boxes are nice and sturdy, easy to put together and don't come apart easily. this is a nice size to use for a variety of things - cookies, cupcakes. i use these often to pack a short 10" round cake that comes with 2 separate toppings - the topping containers fit perfectly right next to the cake. Ordered these boxes along with the Standard 12 hole cupcake insert and they fit perfectly! Box is very durable and easy to assemble. Will be re-ordering. This is a great box. Sturdy and versatile. I use these for sheet cakes, pastries, and a dozen cupcakes with the insert. Great price and the color fits any decor. makes quality products. This is a very sturdy box at a great price. They fit quarter size sheet cakes perfectly and a dozen cupcakes (I use the Cupcake Insert, and they fit great). I Love the look of this box! Perfect for cupcakes when paired with the 10016 Cupcake insert! I tie mine with twine and add my card! Such a polished professional look!! We love these boxes. They look nice and are easy to assemble. Storage is a pain but I am not sure there is any way around that! I love these! They are the perfect color to enhance a from-scratch baked item (cakes, scones, cookies), and are NOT flimsy like other's I've tried. These boxes are good quality but I always have trouble keeeping it closed. I usually have to tape the top so it doesn’t fly open. Other than that it’s good. We used these for meat boxes for Christmas. They have been plenty sturdy to hold a package of frozen steaks, sausages and a bottle of seasoning. We tape the sides just to make certain, but have been plenty pleased with their stability. I purchased these to use with the cupcake inserts, and I am so pleased with them. They hold a dozen cupcakes (in the inserts) perfectly, with enough room for a nice, tall piping of frosting. I also love the look of the Kraft boxes and will be using these often. Great boxes! The cupcake inserts fit perfect in them. They are very sturdy and look professional. These will be my go to boxes from now on! Perfect size for cakes, cupcakes and cookies. Sturdy enough to hold quarter sheet cake, 24 cupcakes and several dozen cookies. Love the natural brown material. These are good quarter sheet boxes. I definitely prefer the ones with a 5" height, but they're hard to find. These do a good job when I can't get the taller ones! These easy to assemble boxes are perfect for all kinds of baked goods! I use them for cookie orders, breads, cakes, cupcakes, muffins. They are nice and sturdy and make for a visually pleasing package. There is something quite elegant about the simplicity of the brown box. This is a great sized box for packing a dozen cupcakes. It assembles easily, and is sturdy. I love that they are also a green product. I absolutely love this box. It is super sturdy. Be ready to gain some arm muscles because it is so sturdy yet so worth it. I used it for my heavy cupcakes without inserts or cake board and it did not wobble at all. My go to box for so many things! I love these boxes for cupcakes with an insert, up to 3 quarter sheets of brownies and bars stacked, scones, muffins, and even bulk cookie orders. Sturdy enough to stack filled and fold together so quick. These boxes are so thin, I ordered them because of the other good reviews, what a mistake. The box may be OK if you use just one for very light stuff, but for heavier stuff like muffins and cupcakes, they will not hold their shape. Because of the thin material, do not attempt to stack them, they will definitely collapse and crush whatever you put in the bottom box. Thank you for your review, Bella! We are sorry you did not prefer this item, please contact our Customer Solutions team for recommendations! I use these boxes primarily for cupcakes (inserts purchased separately) and sheetcakes. They work great for cookies, as well. I love the height - I don't have to worry about the frosting or decorations getting smooshed, as there is plenty of clearance with the 4" height. Great quality. These boxes worked wonderful for quarter sheet cakes or cupcakes in smaller quantities. They hold the weight of the cake great and they look good. The boxes fold up and hold the cakes well and are easy to hold and carry. Very good boxes overall. Love these boxes, they fit the 14x10 cake board perfectly! Makes the cakes look a lot more professional. Will definitely purchase again! Love love these! Box builds easily. Holds the 1/4 sheet board and the 12 count cupcake insert perfectly. Sides tuck in on the inside and two tabs on the top help make for air tight storage. The boxes are easy to fold and look neat and sturdy! They hold 2 dozen cupcakes, and feel secure and safe to carry when full. Great quality product!!! Great, simple and easy to assemble Sheet Cake/Bakery Box. Perfect for 13x9-inch sheet cake or 12 standard size cupcakes (with the perfect fit, cupcake insert). The Kraft color is great and works well with all of the other Kraft color bakery boxes to complete "the look" you are going for. I used to purchase individual boxes from the cake decorating supply store, but the boxes stunk, only came in white and were ridiculously expensive. This past year I easily transported 15 boxes of cupcakes to my husband's office! They arrived in perfect condition and everyone asked my husband where I had purchased the boxes. I also packed full with cookies and brownies for all of my coworkers. Great box, great color and great price. I am very pleased with the quality of these cake boxes. I was unsure how sturdy they would be because of the price, but really wanted to order them because the local store marks these up so high. They don't disappoint. They are a great product and I save a lot of money. I like the brown kraft paper look, and it suits the branding of my bakery, but these are also great to keep on hand for transporting goods off premises in a cost effective manner even if it's not the right "look" for your business. The boxes are sturdy, I can fit two dozen cupcakes in them and they're snug enough so that they don't shift without being crowded/smashed. They do make an insert for these with 12 cupcake compartments, which I'll use for customers doing a pickup. I use tulip liners for my cupcakes so they're not messy when packed tightly. I rarely make sheet cakes so I can't vouch for how well these would work for one. They are noticeably thinner than the white paper bakery boxes makes, but in my use of them I haven't had an issue. I can usually stack these three boxes high when full of cupcakes and not have any issues with them getting scrunched up. Once you fold every seam once, this comes together really quickly and securely. I fit 12 standard sized muffins in one (no frosting) or use them to package multiple items from an order. These are very nice boxes. Hold a 1/4 sheet cake well, unless it is tall. Sometimes box is not tall enough to fit our cakes and then we have to tape the sides in order for the lid to stay open to keep from smashing the top of the cake. Love it! you can't go wrong with these boxes. I love this better than the cupcake plastic container. Made my cupcakes look professional and made the value higher. love the eco color too. Simple yet elegant! These are perfect for all our bread orders of 2dozen or more. Theyre very study and easy to assemble. The only negative thing is since our bread is buttered at the end, the oil does show more with these boxes. These do not come assembled but are very easy to put together! These make product look great when customers take things to go. The cupcake holder fits perfectly in this. I have been using these boxes for nearly 3 years and they're perfect for my businesses needs, holding cupcakes with almost any size fondant topper. Love the color of these boxes. Use the a lot during the fall season as we try to make our cakes look vintage!! Good price! We love these quarter sheet cake boxes. They are strong while still having the lovely natural Kraft paper look. We use these to send out cakes, cookies, and dozens of cupcakes since the inserts fit in snugly! This is a great kraft bakery box for 1 dozen cupcakes. I use it with inserts and my cupcakes stay put and beautiful until consumption. These are easy to assemble and are a good price. Recently switched to using tulip liners for my cupcakes instead of standard cupcake liners. Bought this box and the 12 count liners to hold my cupcakes and they do a perfect job! The quality of the box is good, I just don't like how they close. Difficult to get it closed without messing up the tabs. I just needed a cake box with an open lid to transport a cake to a party.I will say the boxes are strong enough to hold a very heavy cake with only one box needed (as opposed to doubling the boxes). Perfect for our 1/4 sheet cakes, even in height! We also use them for a dozen cupcakes or for other assortments of goodies our customers want to combine. Love these Kraft boxes. We use them for bakery goods and cupcakes. The height is good for our standard cupcakes with a decent amount of frosting on top. We ordered the kraft box for a different look from the standard white box, we love the different look it gives the product a more industrial look, we will definitely be ordering and using these more. I use these for muffins. Each box fits one dozen jumbo (5.5 oz) muffins comfortably. I like that it has recycled and sustainably managed materials in it. I use this boxes for many items, it holds a quarter sheet cake, one dozen cupcakes, cake pops and other pastries. It makes for easy transportation of items and it is SUPER sturdy. Eco friendly and a great color. It is easy to put together and to stack on top of each other. These rustic looking boxes are big enough for a dozen jumbo muffins or a 9x13 cake or a dozen cinnamon rolls! You can't go wrong! This is my go to box for everything from sheet cakes to a dozen scones! It can be hard finding Kraft for such a great price! Please note- the box will NOT hold the oil so I simply line the box with Silicone Parchment Paper. We use these for sheet cakes and with the 12 cupcake insert. Works great for the price but could be a little bit thicker and sturdier in quality. The boxes are easy to put together and work perfectly with cupcake inserts to transport cupcakes. The boxes are also very sound and easy to stack on one another. These boxes are great. They are very sturdy and I use them for so many things; muffins, sandwich rolls, cinnamon rolls. They are the perfect size and hold up the all the stuff I fill them with. I've ordered them twice already and will be ordering them again, I'm sure! Love these Kraft Quarter Sheet cake boxes. I'm just starting my own bakery business for our local farmers market and the kraft boxes have a great down home feel. I use a bakers twine or ribbon to give it that extra appeal. These boxes have multiple uses I've used them for a dozen jumbo cinnamon rolls as well as sampler platters. We order this box so often for our bakery because we use them for so many different purposes. They are a good quality and can be assembled quickly. No dyes! I can place a cake or a dozen cupcakes, with inserts, within and they fit great! I have found this box to be a great addition to my business. I love to bake and this box is perfect for you simple 1/4 sheet cake. The price is amazing and they are also easy to store. Very easy to put together. Love these, since they have many uses. Delivery came fast and the price was just right. I recommend these and will purchase again and again. I really like these boxes, but - when the manufacturer packaged them, not all of them are facing the same way "up". There is a stamp on the bottom of the box that states the size and if it is not facing down when you are folding, once you get the box done you realize that it is inside out and it has to be taken apart and put back together. Not the fault of webstaurant store - it came on time and the price is the best I could find, However, I do hope that the manufacturer fixes this because it makes it a bit of a hassle to check each individual box to make sure which side is up - hard to just grab and go put together. I ordered these with the cardboard dozen cupcake inserts and it works perfectly. We love these bakery boxes. Easy to fold and love the look of an old time bakery. Also love that they don't look greasy if you touch the outside if the box without a gloved hand, unlike the white boxes. I wanted a box, approximately a 1/2 sheet size, to use for Christmas Cookies. I needed a sturdy box that was quick and easy to fold and these fit the bill! I am so glad that I ordered these! I imagine they will be great for more than just cookies! The sheet cake boxes are my favorite for packaging cupcakes with tall toppers that won't fit in the plastic containers. I actually like the brown cardboard look and have had several positive comments from clients about them. Very sturdy boxes and very easy to put together. I use these for cupcakes and with the cupcake inserts they comfortably hold 12 cupcakes. The interlocking flap does not work that well so sometimes I do have to tape the lid down to ensure it doesn\\\'t pop open.